I begin this post with a pretty interesting fact that I posted on Facebook from Barlow Planetarium: “SPRING ARRIVED AT 12:32 P.M. (March 20th), SUN ROSE ON THE NORTH POLE FOR THE FIRST TIME SINCE LAST SEPTEMBER. SUN SET ON THE SOUTH POLE FOR THE FIRST TIME SINCE LAST SEPTEMBER.” So with the advent of more sunlight on our Northern Hemisphere I find the neighbors have come out of hibernation. I am seeing people I have not seen all winter, raking out flower beds and lawns as well as sweeping out the gutters where the terrace meets the street. The first Overflow Week of the Spring comes tomorrow which means the neighbors have been busy cleaning and tossing out the clutter that has accumulated over the past several months. There are even the remains from Christmas past of fir trees on the curb, now turned reddish brown from their once fragrant dark green beauty. Of course everyone is suddenly interested in taking off those extra pounds that have accumulated over a winter with less activity: the joggers are out in their shorts, walkers are out in sweats, and bicycles are back in the racks at the local elementary school. But speaking of bikes, let’s not forget that Wisconsin is home to the Harley-Davidson Motor Company with factory outlets in several cities. So you know Spring has arrived when the motorcycles have returned to the streets. Men, women, and even my 82 year old neighbor Lois are letting the wind meet their face as they roll down the street. Helmets are not required in Wisconsin, it is up to each rider’s discretion, so many ride without head protection for that full face feeling of au natural. I have found that the local neighbors really get into decorating for each holiday. I joined in for Halloween and Christmas, but that is where it ended. But the gaiety continued on to Valentine’s Day, St. Patrick’s Day, and now with Easter. Decorations have been hung out on bushes and in front windows. 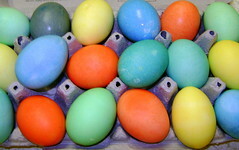 Many holiday enthusiasts hang colorful plastic eggs of all sizes in their ornamental trees along with strings of pastel lights that add a soft, warm glow to their yards in the evening. From personal experience I know dogs are the happiest critters of all with the arrival of the milder weather. Their owners who throughout the winter limited their outings are now getting out for a daily constitution in the morning and in the evening. Snowbanks don’t have to be climbed anymore to meet their needs and trees, light poles, and sign posts, are once again easy, accessible targets. The first walks of warm weather are often interrupted with breaks for catching up on several months of sniffing to see who has been surfing the local turf. Yes, dogs are giddy with the disappearance of their beloved snow and the return of grass. So with this official day having once again returned to the North, Fast Eddy and I have our own little rite of Spring. We end our daily walks by taking a quick walk-a-bout in the yard to see what’s new . Then we retire to the deck to soak up a few more moments of the sun’s warm rays while listening to the sounds of Spring fill the air. Welcome back Spring, my dear friend.